While we all rested on Sunday, the wind was hard at work. We had four days of favorable weather during the first half of 8 Bridges. On the fifth, as we arrived in the morning refreshed, ready to take on The Beast, a south wind was blowing. Marathon swimmers rely on their training, kayakers, volunteers, and organizers, but they also rely on luck. Weather and currents can be forecasted and predicted, but not changed. Waiting in the narrow fjord beneath the Bear Mountain Bridge, the sky overhead was blue, but the water below was no longer flat. There was nothing else to do but jump in and hope for the best. As four solo swimmers and a relay made their way downstream, the day looked promising. The current was running fast early in the course, spirits were high. As the river widened though, the wind was felt. It came in the form of short, choppy, irregular waves, head on. The kind of waves you look at from a boat and think nothing of, but as a swimmer you curse. These waves break your rhythm, and with it your spirits. Gulps of water come as frequently as gulps of air. Getting into the zone is difficult, and staying there is impossible. As the day went on, the waves lengthened out into a more manageable, regular chop, something we could deal with. But during that time, another damage was being dealt by the wind, something more sinister than discomfit and a slight queasy feeling. The wind was slowing our current on the day we needed it the most. 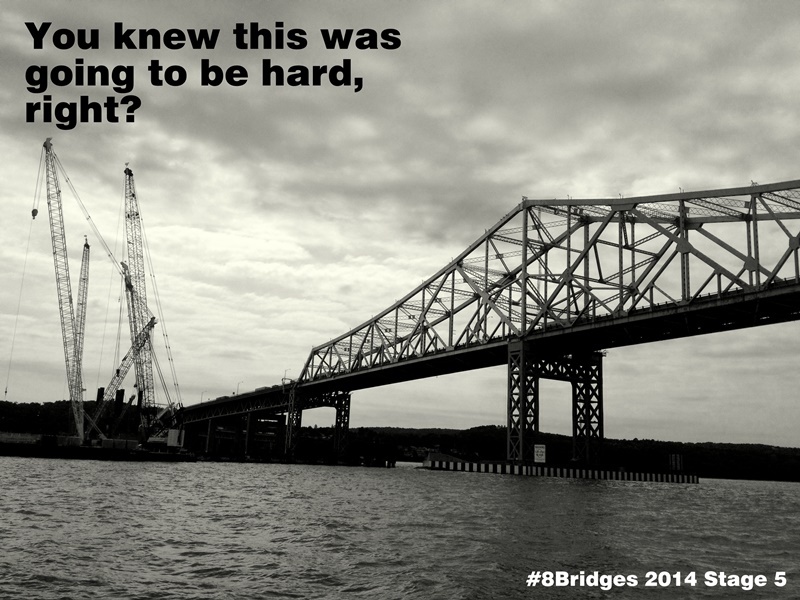 With the river at its widest during Stage 5, finding and using the ebb is critical in reaching the Tappan Zee before the flood. By time the tide turned, no one was at the bridge. The waves were bigger now, and the lack of forward progress was demoralizing. 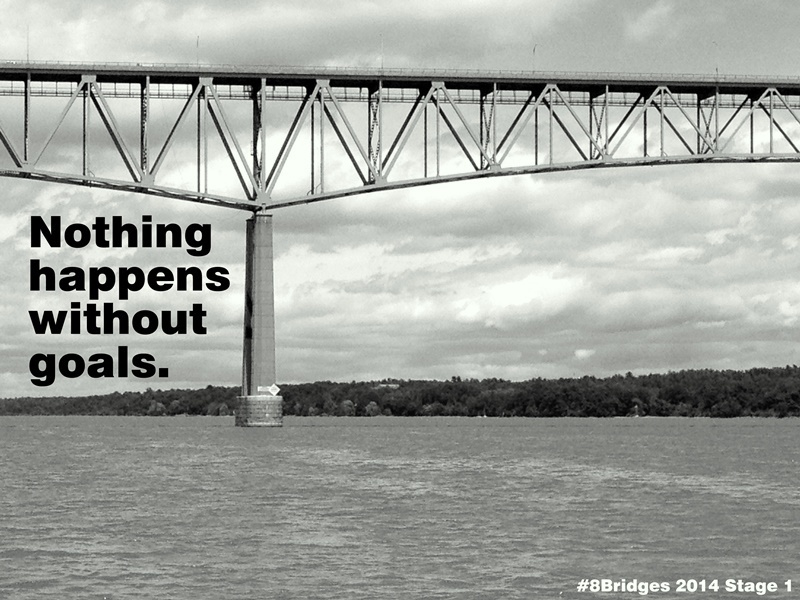 Lighthouses did not fly by; bridges did not grow larger over time. An hour and forty-two minutes after the flood started, Andrew reached the Bridge. Shortly thereafter, the flood picked up to over two knots and halted the relay only six hundred yards from the finish. No one else made it. Stage 6, another difficult day began where the last had left off. The same wind was blowing from the south as eleven swimmers splashed, and the ebb was again slow. Four finished before the tide turned, but all fought the same rough conditions for five to six hours. From the bow we watched our friends pushed backwards from the George Washington. It was sad to see so many not finish, especially when everyone gave a valiant effort. But such is the sport we choose. For a few this event was the goal, but for most it was a part of something larger. For one swimmer who is training for the Ederle Swim, her mood was somewhat lightened to hear that her Stage 6 swim had been tougher than Ederle despite not finishing. Many other swam longer than planned, a feat in itself regardless of outcome. And then the party afterwards. Sun beaten and weary, we pulled into Inwood. Swimmers, volunteers, kayakers, family, and friends mingled into the evening on the deck of La Marina. Sharing stories of the first six days, making plans for the future. The sunset across the Hudson couldn’t brighten the atmosphere more, though it tried. Fatigue waited patiently at the curb while swimmers reveled in the glory of one another. The illustrated guide to the previous post: Take it too far. Dream for as long as is necessary. Then settle on a goal. Goals don’t happen without dreams, and nothing happens without goals. Now stop dreaming and focus. Focus on your goal the way you focus on your breathing, your stroke technique, or your counting of laps during a long pool set. This swim is going to be hard. (You knew that, right?) Make your training harder. Train longer. Train faster. Train colder. Train farther. Train before dawn. Train through sunset, through dusk, and into the dark. Just you and the inky abyss. Study everything. Study past successes and failures, both others’ and your own. Study the tides. Study the course. Study the coasts and the towns along them. Learn physics, biomechanics, nutrition, chemistry. Learn to stay organized. Read everything you can. Never read motivational posters; they are the worst. Don’t blindly trust the experts, check their assumptions. Become the expert, check your own assumptions. Make mistakes and learn from them. Ignore the tides and get stuck in a current. Drink too much the night before. Skip breakfast. Lose goggles. Forget your suit. Now make those same mistakes again. Understand what part everything plays, and know what to do when mistakes inevitably happen. Now make your training even harder. Make it too hard. Too long. Too fast. Too cold. Too far. You don’t know what any of those things are! Stop whining, shut up, and swim. Make friends. Make contacts. Make whatever you need to succeed if it does not already exist. Lose friends. Lose contact with the outside world. Lose touch with reality as everyone else knows it. Make your own reality. Swim all the time. Swim through Love. Swim through Loss. Swim through all the emotions that come in between. Never ask if swimming is the cause or the cure. It is probably both, but knowing that won’t help anything. Swim as your life crumbles around you. Swim while you rebuild it. Never stop swimming. You knew this was going to be hard, right? Accept it. This will be lonely and alienating. Your only friends will be swimmers, and even they won’t understand you. This is a path that few have taken, or ever will. Don’t expect many companions. Treasure those who join you. 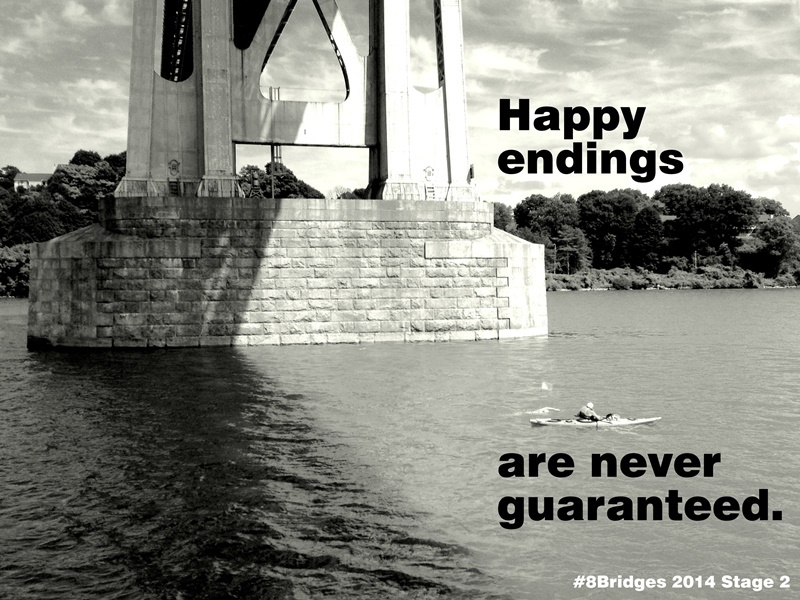 Happy endings are never guaranteed. Accept that things are not always in your control. Train yourself to appreciate small victories. Everything brings a chance to improve, to learn, to succeed. At best, your training will be adequate and your swim will seem easy. Don’t dwell on the other possibilities. If this doesn’t work: make your training harder. This will not be easy. But you knew that, didn’t you. At 7:20 this morning, an hour before the start, we finished loading swimmers and kayaks onto Launch 5. After introductions, a safety talk, and a briefing on the rules, we left the Catskill dock and motored up to the Rip Van Winkle. As the flood tide slowly went slack, the swimmers slathered up with creams, screens, and lotions. One by one, the kayaks dropped into the still water of the Hudson waiting for us in the shadow of the bridge. The four swimmers of Stage 1 were all about to set out on at least four consecutive days of marathon swims. Ed Riley of New York, NY and Heather Camargo of Hollywood, FL will swim the first four stages, with James Penrose from London, England and Andrew Malinak from Seattle, WA continuing on with all seven. Heather: is a frequent participant in her local Key West Marathon Swim. Her daughter got the opportunity to play at Carnegie Hall this June, so Heather is missing the annual Florida tradition. Looking for a bit of adventure up north, she found 8 Bridges. She tried signing up for one or two stages, but just couldn’t stop herself from signing up for four. 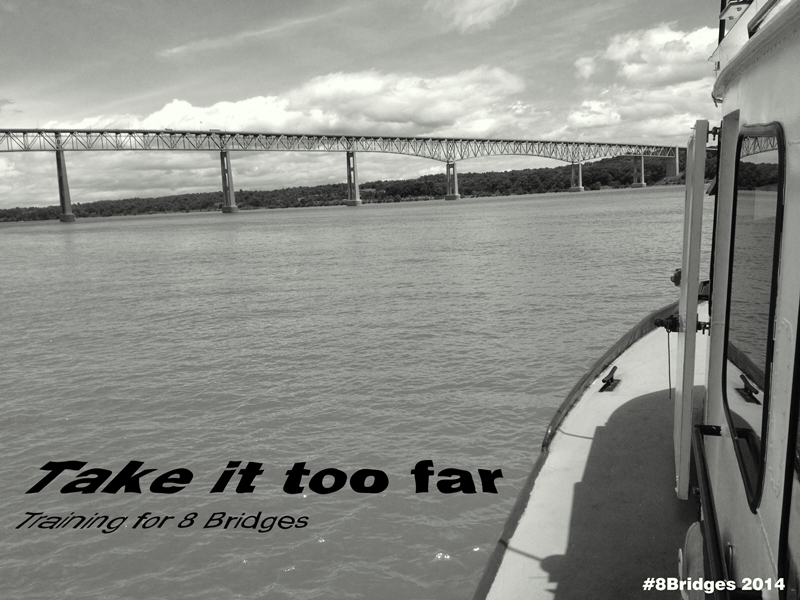 Andrew: has been thinking about swimming the length of the Hudson for longer than 8 Bridges has existed. He finally got around to scheduling the two weeks needed, and is very excited to return to his hometown (Fishkill) to swim in a lot of familiar water. This is a great opportunity to spend time with an amazing group of people in a gorgeous setting. 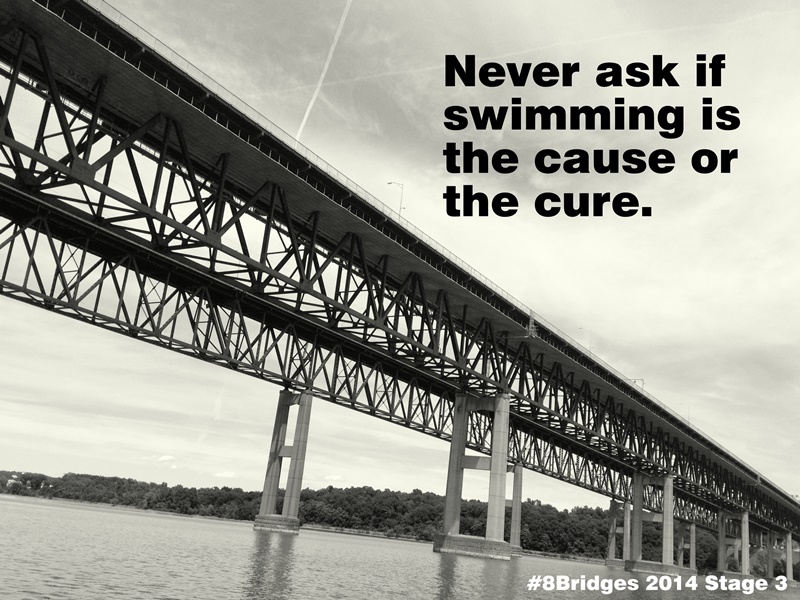 James: heard about 8 Bridges last summer when he met Dave Barra at MIMS and fell in love with the idea. He is looking to use this week as training for some other big, difficult swims he has in his sights, and hopes to come out a stronger, tougher marathon swimmer. What have you done differently to train for this swim compared to other one-off marathon swims? Ed: has taken the “swim all the time” approach to training. A typical week consists of training sessions once every twelve hours (5am and 5pm) six days per week. He focused on interval training during the morning session and distance during the evening, with longer swims on Saturday. He’s been totaling forty to fifty thousand yards per week. Heather: sought advice from the event organizers and added some long back-to-back training swims to her routine. She has also been working to strengthen her shoulders by using paddles and weight training. Andrew: has also been doing consecutive long swims on weekends to prepare himself. Accomplishing this meant altering his training location from the preferred cold water of the Puget Sound to warmer lakes. He has also been making weekly visits to a physical therapist, hoping to avoid shoulder pain early on in the swim. What part of this swim is most daunting? 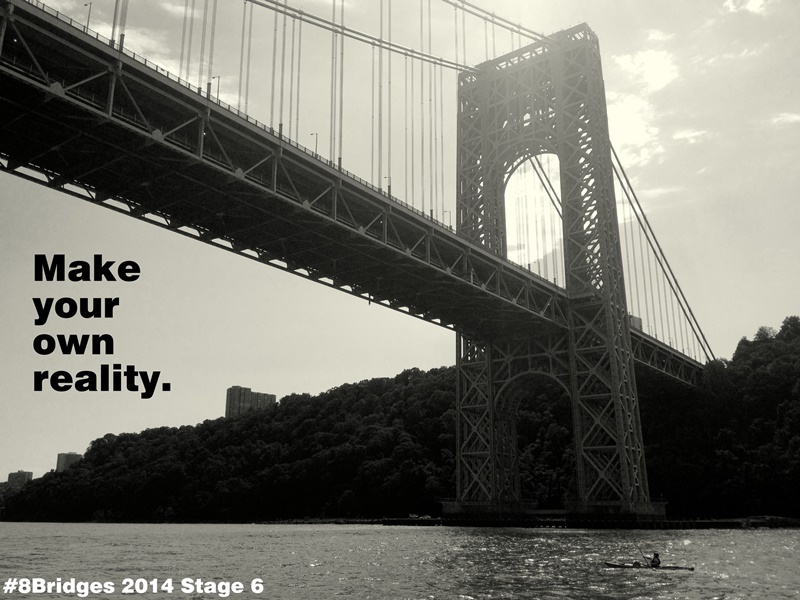 What will you be working on as you swim? Heather: lists pacing as a concern. Swimmers are taught to swim fast, but added speed depletes the body and increases the risk of injury. This swim is about maintaining a consistent, comfortable pace and not overdoing it. James: is hoping to make it through all seven stages honourably. Treading water at the starting line, the path downriver looks very, very long. Ed: sounds worried about the start of day two. Jumping in after day one, well he is expecting “a bit of an ouch.” But, he reminds us, no one wants to see a grown man cry. I suppose that’s why we all wear goggles, to hold the tears in. 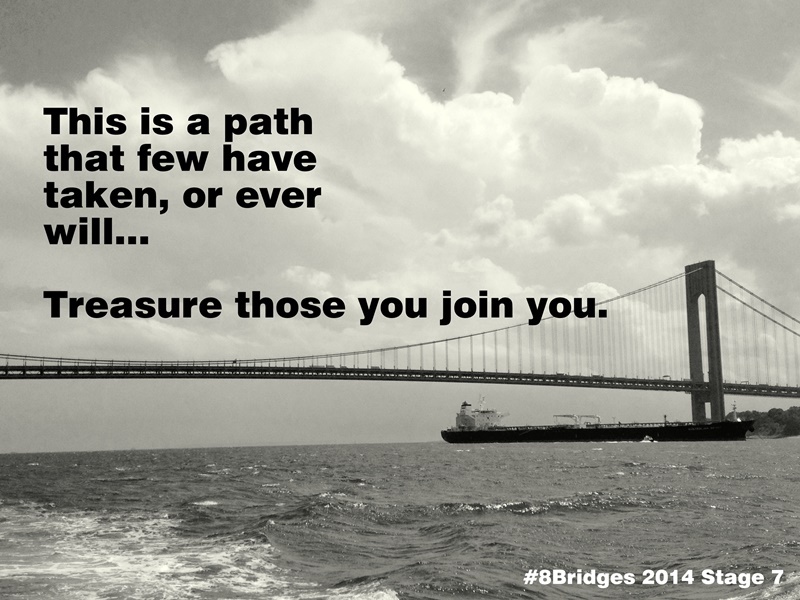 Three, two, one…8 Bridges has begun! There are a lot of things to be nervous about before an open water swim: the temperature, the distance, the sharks, the navigation, the boredom, etc. It is no secret; I get a little feeling of superiority watching pre-race jitters occur before a triathlon swim, because really what could possibly go wrong in such a short swim? Now I’m not saying I never get nervous before a swim. Turn the distance dial up past ten miles, or turn the temperature dial down below fifty degrees, or throw some tricky weather and currents in front of me, and I’m bound to start second guessing my preparations. But 8 Bridges is different. I’m not worried about any one stage of 8 Bridges. Individually, there is nothing about them that frightens me. The water will be warmer than what I’ve been training in, but not too warm. The distances and required paces are easily achievable with how I’ve been training for the past seven months. This weekend’s training was the equivalent (by time) of swimming stages two and three. I’m not scared for any of swims, and in fact the exact opposite – I’m excited for all the swims: the scenery, the people, the atmosphere. A few weeks ago, I was scared for the second morning of 8 Bridges. Rondi told me that it’s like hiking the Appalachian trail; you start off a bit stiff each morning but then get into the rhythm and it’s all wonderful. Maybe that was her experience on the Appalachian Trail, but my brief time on it was three days of pain, discomfort, bowel irritation, and constant damp. Not the ideal metaphor for a good time. Throughout my training, I’ve been scared that my shoulder would start hurting again on day one and make the full swim impossible. It is pretty painful when it hurts, but the pain goes away in a few weeks and then I’m good to go. Sadly, I don’t have a few weeks of recovery between swims, I have maybe sixteen hours. Luckily there is PT. Over the past three months I’ve learned a bunch about my joints, muscles, nerves, and posture that, so far, have kept the pain from recurring. I’m being cautious, but I don’t think it will be an insurmountable problem. I was scared for day two, the waking up early and jumping in after the previous day. But this weekend’s training has got me thinking maybe day two won’t be so bad. After this weekend, with some critical lessons in preswim nutrition, postswim nutrition, stroke technique, and general mental toughening behind me, I’m not scared for day two. Rondi was right, it really isn’t that bad. Look at me conquering my fears! So now I’m scared for day three. I’ve not seen day three yet. On Sunday of Memorial Day weekend, with less than a month to go before 8 Bridges, I was in the pool starting up a long workout. I’d gone for a long swim in the Puget Sound the day before, but with temperatures hovering around 51F, by “long swim” I mean just over 4k. Not nearly long enough. So I resigned myself to getting some much needed yardage in the pool on that dreary overcast Sunday. But reverting to long pool swims at this time of year is difficult, having open water so close and accessible and relatively warm. Somewhere in the midst of the first kilometer I gave up. But around that same time I had a beautiful revelation. 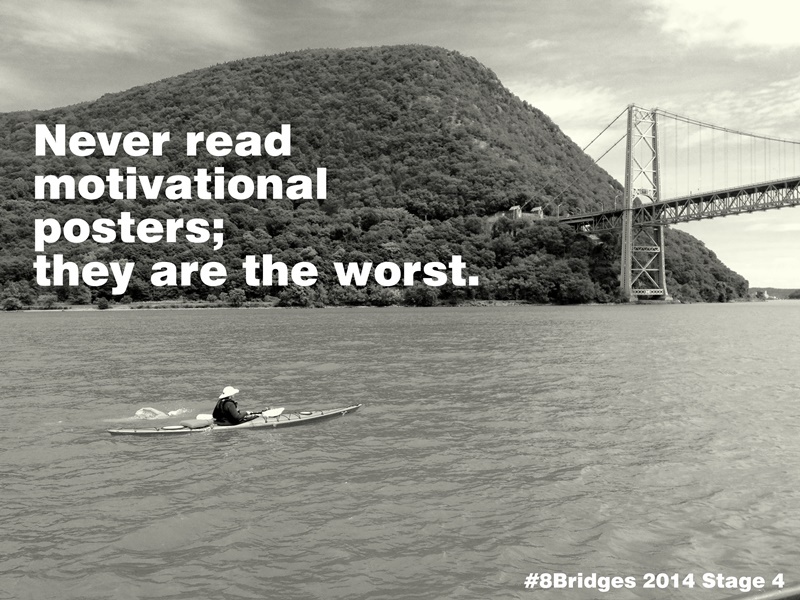 8 Bridges is not a cold water swim, nor is it a salt water swim, so why wasn’t I training in Lake Washington? Pride and preference and lack of imagination. The next afternoon, I headed over to Seward Park to try it out. And it worked! That day was my longest swim of the season, completing two laps of the 2.4 mile circumference peninsula. It felt so good to be able to get into that peaceful mental state where movement comes without thinking and there is no other reality besides the aqueous one all around. That mental place is somewhere I haven’t been in a long time. The Puget Sound is beautiful, exhilarating, and downright fun, but swimming in the Sound can be dangerous if you go too far. Survival requires thought, and the Sound requires survival. In warm waters of the Lake, there was no fear of hypothermia, no need to figure out the tides and currents and if I’d make it back in time. There was only swimming: stroke after stroke after analyzed, critiqued, and perfected stroke. With June Gloom yet to show up and a bright sun shining down on the Lake’s low-60 degree water for the two following weekends, there was no reason to hold back. The first weekend of June I swam three laps on Saturday with another two on Sunday. Then four laps and three the next weekend. This was new to me, back to back long swims, but this is what 8 Bridges is, times 7 (or times 6, or times 3.5, depending on your method of calculation). This is the training I needed, not a glorious swim with starfish or a dismal swim in a small pool. I chose Seward Park because it provided short intervals across a dockless stretch of shoreline where figuring distance would be easy, and where friends could come and go with me as they pleased. In the five swims and fourteen laps, Steph joined for four, Dan and Melissa for three, Alison for two, and Dave for one. Their company was wonderful; it kept me on pace and helped me forget what a lonely, dull place is the back of Seward Park, and what a gross body of water are the shallows near the start and finish. Yeah, the Lake isn’t the greatest of lakes. Pretty soon the water will be up in the 70s, and I’ve had enough of dodging boats in the anchorage of Andrew’s Bay, and more than enough of the duck itch (swimmer’s itch) I’ve been scratching at for a few weeks now. It’ll be a while before I go back. While I’m looking forward to my return to the clear, cool, life-filled waters of Alki Beach, I will miss being able to swim for hours and hours the way one can in warmer waters. Oh and this: Please don’t feed the ducks!